There are many horse riding holidays available in Ireland, but few offer this level of luxury with a cultural twist. Time is precious in today's world and this luxury holiday will make the most out of every moment you give it. Connemara Equestrian Escapes wants your holiday to be a unique and memorable experience. They have handpicked the accommodation for the quality of service, award-winning dining experiences and on-site facilities such as golf, clay pigeon shooting, and tennis. The selection of Connemara ponies are home-bred for their extra height, kind temperament, and often quirky character and by the end of your holiday, they will be your best friend. The ponies are lovingly cared for and they demonstrate their payback in the form of trustworthiness. For the taller rider, the Irish Draught horses are often called upon to allow for a more elevated viewpoint! Accommodation is provided in Connemara Equestrian Escapes' own lakeside farmhouse Curra Farm and Renvyle House Hotel & Resort. Connemara Equestrian Escapes is delighted to be able to include Curra Farm as one of their select accommodation providers. It is a limestone built modern farmhouse. The house has five bedrooms and is finished to the highest standard with local stone and timber throughout, ensuring that guests can be certain of a comfortable and spacious place to unwind and relax after their day’s activities. 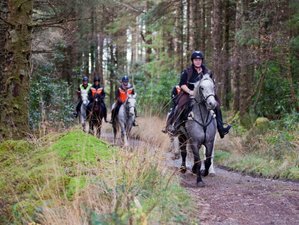 As well as a large, flood-lit all weather sand arena and 12 stables on-site, Curra Farm also has a small cross-country course and wonderful off-road tracks for exploring the forestry and lake shore. The facilities on-site and nearby are second-to-none and cater for riders and non-riders alike. Renvyle House first opened as a hotel in 1883. It is a historic country house hotel. Renvyle House Hotel & Resort is situated on Ireland’s Wild Atlantic Way.The hotel is located on 150 acres which include a private lake, a nine-hole golf course, a beach, woodlands, gardens, and numerous activities on-site. It is an award-winning hotel for hospitality over the years with a warm welcome for every guest, delicious food, and comfortable bedrooms. Please note that single rooms at both Curra Farm and Renvyle House Hotel & Resort attract a single supplement charge. Connemara Equestrian Escapes' ponies and horses get the utmost respect they deserve and they encourage the riders to spend as much time as they desire getting to know their new partner for the week. The guests are taught to care for, groom, and saddle their horses. Away from the tourist crowds, you will witness the most spectacular views of Connemara from the seat of your Irish-made saddle. Flushing out the constraints of urban life, Connemara Equestrian Escapes will awaken your senses to the miles of paths strewn with an expanse of wildflowers amongst the heather-covered mountains and mystical lakes and rivers. Your free spirit will be opened as you rekindle your natural bond with nature. The equines take you on a journey each day with paces that suit all of you to absorb the scenery, air, sounds, and aromas of the beauty that surrounds you. The terrain is kind but rest assured that the sure-footedness of your Connemara pony or Irish Draught horse will take you along your trip safely. The day's ride is never complete without a long canter to tease out the adrenaline and work up an appetite for lunch after which your daily cultural experience will captivate your mind. You will be collected at the tourist office in Galway city to travel to Moycullen, at the gateway to Connemara and then on to Curra Farm, the breeding ground of Connemara Equestrian Escapes' Connemara pony herd. Before your riding adventure begins, you'll have an opportunity to settle in, relax in your room, refresh in the bath or take a walk around the farm. Once you’ve settled in, you will have a quick familiarization with the tack and the English style of riding before being paired up with the Connemara pony that will be your partner for your holiday. After an initial assessment in the outdoor arena, you will be ready to set off for a short trail ride around the farm before the chef cooks a traditional Irish meal in the comfort of your home away from home. Relax on the boat-shaped deck or have a glass of bubbly in the outdoor hot tub. Today, your ride will take you on a quiet country road from the farmhouse to a local forest that can only be described as a scene from a Harry Potter movie. As you weave your way through the narrow passages in the trees, you pass through the remains of a famine village deserted in the late 1800’s. Continuing on to a sand track, you will have an opportunity to up the pace for a while. You will pass the remains of Moycullen Castle and learn more about the local history and culture before returning to the enchanting woods where you stop for a picnic. After returning to the farm and grooming the ponies down after the long ride, you will have a chance to refresh yourself before you visit the home of Connemara Marble and onwards for a tour of Aughnanure Castle. This evening, you will light up the BBQ and enjoy a relaxing evening on the boat-shaped deck in the garden with wonderful views of Lough Corrib. Today, now that your pony / rider relationship has developed, you will have a chance to improve your English riding skills in the arena with one of Connemara Equestrian Escapes' expert instructors. You will practice your dressage skills and the grand finale will be your musical group ride. You choose the music and you will be surprised at how synchronized the ride will look when you play it back later on the TV. After lunch, you will travel to Brigit's Garden Galway Ireland for a tour and time to relax in the cleverly landscaped representation of the four Celtic seasons of the year. Tonight, you will dine out in one of the local award-winning restaurants to sample Irish style gourmet dining at its best. Today, you will pack your bags, horses, and tack for the onward transfer to your second accommodation, the wonderful Renvyle House Hotel & Resort. En-route, you will visit the hidden treasure of Glengowla Mines where you descend over 120 feet into the mine shaft to witness the hardship of the mining industry that many locals endured to survive centuries ago. The owner, Keith, will take you on a tour of the on-site “Klondike” film set before he gives you a working sheepdog and turf-cutting demonstration. After check-in at the four-star Renvyle House Hotel & Resort, your ponies will be ready for a ride around the 150-acre hotel property, taking in the spectacular views while soaking up the fresh Wild Atlantic Way air. This will work up your appetite for the five-course meal ahead, to be prepared by Renvyle’s award-winning chefs. After being spoilt by choice with the extensive “cooked to order” breakfast menu, you will travel through the Quaker village of Letterfrack, the home of Connemara National Park, to the grounds of the wonderful Kylemore Abbey. Connemara Equestrian Escapes normally allows three hours for this tour, taking in the abbey itself, the spectacular gothic church (modelled on some of Europe’s biggest cathedrals) and the wonderful walled gardens. Your ride today will take you around the Renvyle peninsula. More spectacular scenery and history talks along the way allow you to envisage the life and traditions of the generations gone before you. Later, at the hotel, take a dip in the ocean, the outdoor heated swimming pool or Canadian hot tub, or simply relax with one of the many books in the hotel library before dinner. Today you will load up the horses for your trip through Clifden town where you will have an opportunity to stop and stroll around the town and maybe visit the Connemara Pony Museum and some of the gift shops and art galleries before your ride at the wonderful Omey Island. At low tide, it is possible to ride, drive or walk across the large sandy strand to the island by following the arrowed signs. Again, the pace will be your choice and if you dare, you can even swim with your horse before you stop off at the local pub with spectacular views of the island for a chowder or fresh crabmeat salad to name but a few choices from the menu. Dinner that evening will be served at the hotel. Today, after a hearty breakfast you will say farewell to the ponies and horses and your private coach will take you from Renvyle House back to the tourist office in Galway city at 09:30 for your onward journey. Note: The itinerary is subject to change, as Connemara Equestrian Escapes cannot predict the weather or other environmental conditions. Every one of Connemara Equestrian Escapes' ponies and horses has their own unique personality and markings. But, what they all have in common is that they are attentive, honest, reliable, surefooted, forward going, and kind. Connemara Equestrian Escapes guarantees you will have made a new equine friendship by the end of your time with them. The Connemara pony has developed into the ideal all round pony, capable of excelling in any equestrian sphere. The origins of the Connemara pony, Ireland’s native pony, are shrouded in mystery. Some believe that today’s Connemara ponies are descended from Viking ponies, brought here by the Celts in the fourth century B.C. Others tell the tale of Andalucian horses swimming ashore from a shipwrecked Spanish Armada in the 16th century to breed with local stock. Wherever they came from, these tough and versatile animals have established themselves as an integral part of the economic and social history of Connemara. Just like Ireland’s only native breed horse, the Irish Draught, the Connemara pony was very much a working animal. Its strength and sure-footedness made it ideal for negotiating the rough and inhospitable terrain of mountain, bog, and seashore. Its strong, broad back carried turf and seaweed in creels. It provided transport between the shafts of a cart or a trap. Natural hardiness helped it to survive the harsh winters, with little food or shelter. The Irish Draught horse, the only native breed of horse in Ireland, has made the Irish horse famous throughout the world. It is a versatile, athletic, and intelligent horse, with a wonderful temperament. Throughout the world, Irish Draught horses are prized for their ability, versatility, stamina, docility, and good sense. Like the Connemara pony, traditionally, the Irish Draught was the horse of the countryside. It served as the ultimate utility animal on small Irish farms, providing work, entertainment, and transport. Plowing fields is one of its job descriptions. Their calm nature, good sense, and physical strength make Irish Draught geldings ideal for mounted police forces in Britain and Ireland. The upsurge in leisure riding in recent years has given the Irish Draught a new outlet. Their gentle temperament and natural honesty make the Irish Draught horse perfect for the leisure or casual rider. Connemara Equestrian Escapes uses Irish made saddles (English style), handcrafted by Berney Brothers Saddlery in County Kildare. These saddles are a durable, comfortable jumping / general purpose saddle made of quality leather. They have a moderately deep seat, knee and thigh blocks, and a cleverly shaped cantle, which makes for great security and comfort. Horse breeder for over 20 years, horse rider for 40 years, she is completely horse crazy. As founder of the trail riding business in 2013, she left behind a 25-year-old career in the I.T. industry to be with horses and show riders from all over the world the beauty of the Connemara region in Ireland. This holiday will be held in County Galway, Ireland. You will first be taken to Curra in Moycullen then to Renvyle. Along the way, you will visit Aughnanure Castle, Brigit's Garden Galway Ireland, Glengowla Mines, Kylemore Abbey and Victorian Walled Garden, Clifden, and Connemara Pony Museum. Your place of stay, Curra Farm (Teach na Corra) sits on the edge of Lough Corrib in a beautiful and peaceful rural area. The second accommodation, Renvyle House Hotel & Resort, is situated on the Wild Atlantic Way in the wild splendor of Connemara on the shores of the Atlantic Ocean. Lough Corrib is the second largest lake in Ireland. It covers 176 square meters. In the 12th century, the first canal on the island of Ireland was cut to allow boats to travel from Lough Corrib to the sea. It was once believed that there are 365 islands on Lough Corrib but more recent surveys have shown that there are 1,327. One of the most famous of these, at the narrowest point of the lake, between Maam and Doon, is where Hen's Castle (Castlekirk) is located. This strategically placed castle played a very important role in Irish history and was one of Ireland’s female warrior's, Grace O’Malley (Grainnuaile), many homes in the area, and the scene of several bloody battles. Located just two miles outside Oughterard, approaching from Galway on the N59, is this 16th-century Irish tower house. Aughnanure Castle lies in picturesque surroundings close to the shores of Lough Corrib. Standing on what is virtually a rocky island, the castle is a particularly well-preserved example of an Irish tower house. In addition, visitors will find the remains of a banqueting hall, a watchtower, an unusual double bawn and bastions, and a dry harbour. The castle was built beside, and at some positions straddling, a small river, the Drimneen, that has cut intriguing caverns in the stone below it. The building consists of a small (probably) guard look-out, a lower floor for storage and two upper floors, one used for living quarters (containing a secret room) and the other for sleeping. At the top of the castle, there is an area to take in the fabulous views of the surrounding area. Outside the castle are two courtyards, one original and one that was added at a later period. There is a well-known fable that there was once a trap door where unwelcome guests could be dropped into the river flowing below the courtyard. The award-winning Celtic gardens are widely regarded as one of the most spectacular in Ireland, set within 11 acres of native woodland and wildflower meadows. In addition to the Celtic gardens, visitors can enjoy the nature trail, an ancient ring fort (fairy fort), thatched roundhouse and crannog, and the calendar sundial, the largest in Ireland. Brigit’s Garden's four main gardens represent Celtic fire festivals and are surrounded by meadows sown with native wildflowers, a lake, a fairy fort, and native woodland paths. A walk through the four gardens takes you on a journey through the Celtic cycle of the seasons, each garden representing one of the Celtic festivals of Samhain, Imbolc, Beltane, and Lughnasa. This seasonal cycle mirrors the cycle of life from conception to old age and death. The design weaves Celtic stories with contemporary design to create spaces that are beautiful and tranquil yet inspiring and full of life. Situated in the west of Ireland in County Galway, Connemara National Park covers some 2,957 hectares of scenic mountains, expanses of bogs, heaths, grasslands, and woodlands. Some of the park’s mountains, namely Benbaun, Bencullagh, Benbrack, and Muckanaght, are part of the famous Twelve Bens or Beanna Beola range. The Station House Connemara Pony Museum is situated in the restored Clifden railway station complex and is housed in the original engine shed built in 1895. It provides the perfect ambiance for the exhibition designed for this distinct museum. Kylemore Abbey and Victorian Walled Garden welcome visitors to discover the magic, beauty, and peacefulness of Kylemore Abbey. Kylemore is home to a community of nuns of the Benedictine Order who came here in 1920 after their abbey in Ypres, Belgium was destroyed in World War I. Settling at Kylemore, the Benedictine Community opened a world-renowned boarding school for girls and began restoring the abbey, Gothic church, and Victorian Walled Garden to their former glory. Omey is a tidal island situated near Claddaghduff on the western edge of Connemara. From the mainland, the island is inconspicuous and almost hidden. The island is the site of a monastery and settlement founded by Saint Feichín, who is believed to have established many such communities across the west of Ireland. Renvyle peninsula at the western end of Connemara is an area of outstanding scenic beauty, attracting poets, painters, photographers, and artists for centuries. Long stretches of clean, secluded, and quiet sandy beaches can be enjoyed on horseback or on foot. The crystal clear water is ideal for swimming or snorkeling. Country lanes with little or no traffic welcome the sound of hooves as Connemara Equestrian Escapes' riders make their way around the peninsula. The castles, ancient fort, and ecclesiastical remains on Renvyle peninsula are prized gifts of an epic past. Enjoy the fresh sea air, peace, beauty, and closeness of nature on horseback with Connemara Equestrian Escapes. The Wild Atlantic Way is Ireland’s first long-distance touring route, stretching along the Atlantic Coast from Donegal to West Cork. Food in Ireland is as much an experience as the people and the landscapes. On this trip, you will be spoiled with homemade Irish stew, full Irish breakfasts, gourmet meals prepared by award winning chefs, and many opportunities to enjoy local pubs. Remember, you're on holiday, so enjoy the food. Expect a variety of cereals, bread, yogurts, fruits, tea, and coffee for breakfast at Curra Farm. You may try the full Irish breakfast or one of the many breakfast options at Renvyle House Hotel & Resort to set you up for the day. Lunch will usually be enjoyed at a local pub where there is enough variety to meet everyone’s needs. Picnic lunches will accompany some of the rides. For dinners, enjoy homemade stew, fresh fish or lamb and all the local seasonal veggies you can handle. Prepare yourself for two five-course meals at the hotels. They are absolutely divine. Ireland is like many European countries when it comes to meal times. Breakfast will be anywhere from 08:30-09:30, lunches are late afternoon (14:00-15:00) and dinners are after 19:00. If you need snacks between these times, it is advised you bring some along on the tour. Furthermore, water is safe to drink out of the tap at the accommodations. In the city, you will find sufficient vegetarian choices in most restaurants. A variety of freshly-prepared foods will be available throughout the tour. Meals are designed for omnivores, but the outfitter is able to satisfy vegetarians. Strict vegetarians / vegans / gluten free are advised to bring food supplements from home, as many specialty items may be unavailable. If you have food allergies or restricted diets, you must inform Connemara Equestrian Escapes as soon as possible. Review allergies and restrictions with your guide and other operations staff during the orientation meeting or early on in the trip. Please book your flight to arrive at Shannon Airport (SNN) or Dublin Airport (DUB). Please arrive in Galway before 13:00 (local time) on day one. Connemara Equestrian Escapes recommends a ‘jetlag’ day, i.e. fly into Ireland and maybe stay in Galway city prior to day one to get over any jetlag issues and have plenty of energy to enjoy your intensive, fun-filled seven-day itinerary. You will be collected at the tourist office in Galway city to travel to Moycullen at the gateway to Connemara, and then on to Curra Farm.